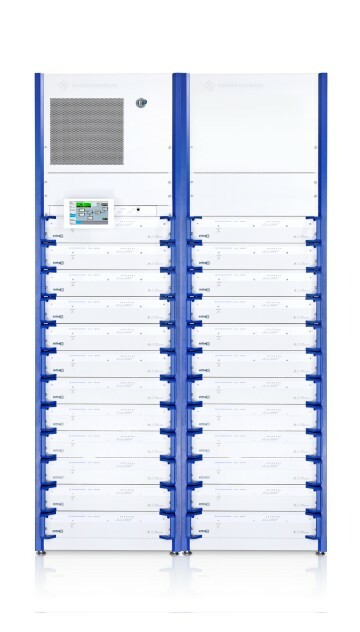 Rohde & Schwarz has enhanced its R&S THU9 transmitter family to deliver even higher maximum output power. The ATSC standard has been included to make the transmitters perfectly suited for the North-American market. The transmitters are available in the same power range as the inductive output tube (IOT) transmitters currently used there. At the same time, broadcast operators will benefit from the innovative concept of the transmitter family, which delivers, among other things, energy efficiency of up to 42 percent for the ATSC standard. The transmitters support the established digital and analog standards. The flexible design of the R&S THU9 transmitters allows them to deliver extremely high output power. Multiple racks can be combined for this purpose. The transmitters can be precisely scaled and deliver up to 50 kW of power in just four racks. By packing so much power in so little space, it has been made possible to replace the inductive output tubes used to date in the US. Here, Rohde & Schwarz transmitters are able to deliver comparable energy efficiency. Rohde & Schwarz uses Doherty technology to achieve superior efficiency, e.g. up to 42 percent for the ATSC standard. The basic principle is to split signal amplification between two paths. The advantage is that the main amplifier amplifies only the average signal. As a result, this path does not require any reserve capacity for power peaks. The path for amplifying power peaks, on the other hand, only needs to be activated when power peaks are identified. Compared to IOT transmitters, the R&S THU9 transmitters also achieve higher availability. IOT transmitters usually come as a pair of transmitters, meaning that if one transmitter fails, the output power is cut in half. In a solid state system such as the R&S THU9, many components, such as power amplifiers and transistors, are designed for redundancy and therefore significantly contribute to system availability. The power supplies integrated in the amplifiers of the R&S THU9 even offer total redundancy, meaning that if one power supply fails, this will not affect the amplifier’s output power. The transmitters use only standard mains voltage. By contrast, an IOT transmitter is operated at high voltage, which also makes maintenance more difficult. Performing maintenance on R&S THU9 transmitters does not require any special equipment or safety training. This reduces operating and service costs during the transmitters’ service life. The R&S THU9 transmitters with output power levels previously achieved only with IOT systems are now available from Rohde & Schwarz.